CW "grad", Aiden Cole, pulled to turf in late going. 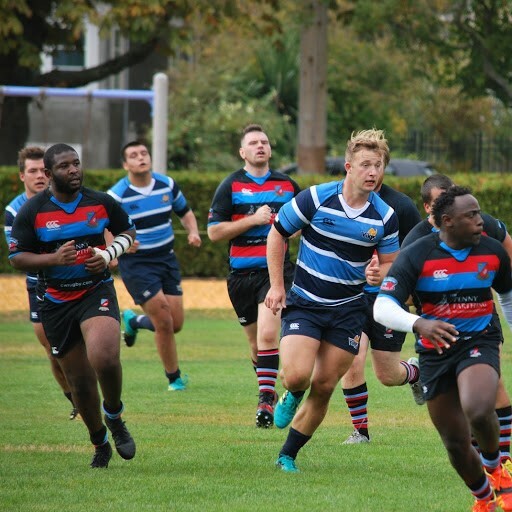 Opening Day at the House saw an impressive crowd assembled to enjoy two diverse games of rugby. It was not expected that the track-meet would occur in the curtain-raiser but a fit and rather large group of Norsemen lads, led by newcomer, CW grad, Nick Carson (M-o-M), carved up the home team rather handily, 48 – 38. 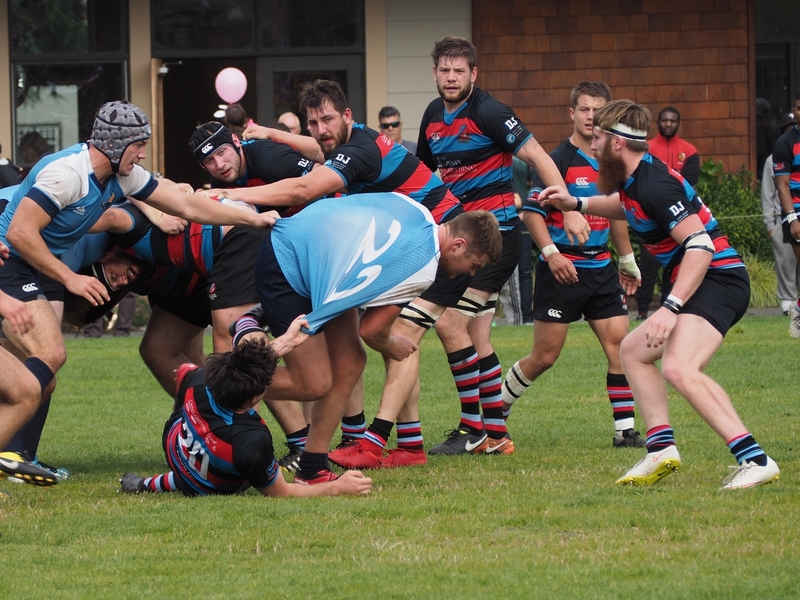 There were CW “faces” aplenty in UVic jerseys and Jonah Hall probably had one of the best games this pundit has seen from him since being at Uvic. It is to be hoped for him, he can remain injury free and perhaps achieve an earlier displayed exciting potential, earning some Viking time as the season progresses. Other displays from the Norse that proved a thorn in the Divvies side came from #9, Teufel (M-o-M and later also proving a threat as a sub for the Vikes), Teddy Zinkan, son of his more well –known dad, Ted Sr. who captained the Vikes during his studies and Lockie Kratz put in a solid cameo in the mid, second stanza. The Norse opened the scoring and CW returned the favor with some enthusiastic play featuring “old boy” Steve Grdic who had his customary “lively” performance – welcome back! It was close at the half, 29 – 24 to the Visitors but a rampant display from Carson with at least a brace, maybe a hat-trick, opened a healthy lead and it was too little, too late as the Divvies tried to claw back in the late going. Lucas De Vries, fullback for the Norse, also deserves mention. For The Tricolors, interesting to see Alex Kanty back on the pitch at #9 and #10 Gareth Sander earned M-o-M honors from the players. I liked Sawyer Heron in the pack and last season’s, MVP, Makaroff was once again, tireless. Samaria got the vote for forwards M-o-M and Gus Boyd-Porter in the custodian role tried hard to make a difference. Akin to last season, this group appears to have great potential and many will get the call for higher honors, so hopefully the numbers continue coming out to keep thigs “seamless.” Go, Divvies! The Premier outing promised much but really did not quite deliver. For the victors, the combinations were rusty, many having not played together, at least for a while. Both teams tried constructive efforts but the plots were not really evident. Play opened with good phases of retention for the Vikes but it was mere three minutes in when Dougie Fraser, brashly stepped up and intercepted for a 30 meter run and try under the sticks. In the very early going the CW set piece made an impact statement, shunting the Vikes back to earn a penalty. CW had field position and kept the hammer down but it was to be a creative individual effort that would make the highlight reel when from a defensive “short” lineout, Crosby Stewart took the ball on the long throw and quickly putting it into high gear, wrong – footed McCloskey, Schellie and out-gunned Pitblado for a 75 meter scamper and equalizing points. CW responded with a nifty break by Owen which nearly put Fraser away and added some good running to counter Bowd’s kicks. From one of these counters, Pat Kay, sliced the can open sending Stewart on a scything run, feeding Pitblado, on to McCloskey for a 14 -7 lead at the thirty minute mark. So it remained for the next ten minutes to the interval as the sides tested back and forth with real commitment from the students. The interval saw CW substitute liberally with Owen coming off with a hamstring issue. Pat Kay moved to #10, Isaac Kay (welcome to Ceedub), came on as did Luke Bradley with a shuffle in the pack. Luke Bradley’s decision in joining CW is a confirmation to the club of a mutual respect and bonding we have had over the years with Jas and his devoted Black Sheep. Welcome, Luke and we hope your games with us are most enjoyable. CW earned an early penalty, took a quick tap and went blind for McCloskey to show clean heels for his brace, 19 – 7. Increased questions were asked and when Schellie moved to the #9 spot his ‘giddy-up’ seemed to enliven his outside men and good handling saw Isaac Kay over for his first as a Tricolor, 26 – 7. Pat Kay was starting to find some telling gaps but it was Ollie Nott who had the next say with a fine individual effort, going some 45 meters and narrowing the gap to 26 – 14 with fifteen to go. CW showed patience in their next build up and the ball came to Bradley, a subtle shimmy from Adibe on to Morra for 31 – 14. It all became a little sloppy with not much shape to the attack, liberal subs and lack of cohesion apparent. From some loose play in his own half, Pat Kay made a break and fed Mike Adibe who went 65 meters for the exclamation mark, outpacing a tiring Findlay in an exciting foot race. Final score, 36 – 14. Players voted Nathan Yue and Crosby Stewart M-o-M for the Vikes and Cam Polson and Schellie for the hosts. For the Vikes, I thought Carson Oliver and Ollie Nott in the pack, deserved mention and Gradyn Bowd in the backs put in a solid day’s work, Nott’s lack of size, sadly probably limiting him from higher honors but he is a hard-working, talented player. For CW, Burger Thornber and Braddock labored tirelessly and despite a good game from Cam, I give Nate Stewart my nod. The backs had fun and their lesser-known counterparts rose to their challenge not to make anything easy. Pat Kay was my pick but I sure like the game Adibe put in. It is early times and this plethora of talent will be seldom available but it was still a pretty good hit-out. This writer wishes the Sevens players best of luck as the altercation they have with Head Office continues. Thanks to today's officiating crews in both games - good job. Next week, the whole show – men and women, travel to the Hub City to take on the Hornets. OPENING DAY and sixteen U6 registrants!